The British begin to rule the Massachusetts Bay Colony more directly. They finally restore the celebration of Christmas, 20 years after its restoration in England. Decades of tensions between the Colonists and the Crown erupt when James II becomes king and revokes the Massachusetts Bay Colony’s charter, placing the Colonists under direct Royal control. Colonists assert that the Native Americans “claimed” the land before the English. In support of this argument, Charles Josias, also known as Wampatuck, gives evidence that as early as 1630, the Massachusetts Bay Colony obtained a grant from the Native Americans for the Shawmut Peninsula occupied by Boston - meaning that both the colonists and the Native Americans recognized the Native American's "ownership" of the land. As you might imagine, King James disregards this argument. James II appoints Sir Edmund Andros as Royal Governor of the Dominion of New England and gives him power to make laws, assess taxes, and dispense justice. 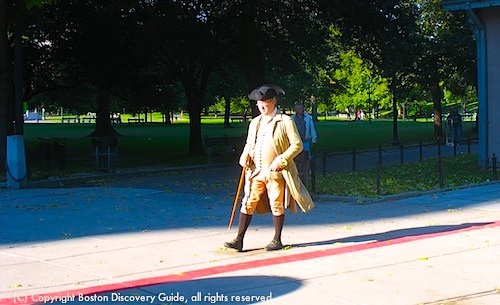 As soon as Andros arrives in Boston in December, he lays the foundation for dissent in the Massachusetts Bay Colony, and also commands other New England colonies to surrender their charters. He voids the colonists’ titles to their land, and requires them to pay 50 pounds to regain use of their land. Over the next 2 years, he fines and imprisons a number of Massachusetts residents, denying them the act of habeas corpus. Early in the year, the colonists receive word that William of Orange seized power in England in November 1688, dethroning James II. The colonists have the pleasure of imprisoning Andros and some of his henchmen, and later send them back to England. 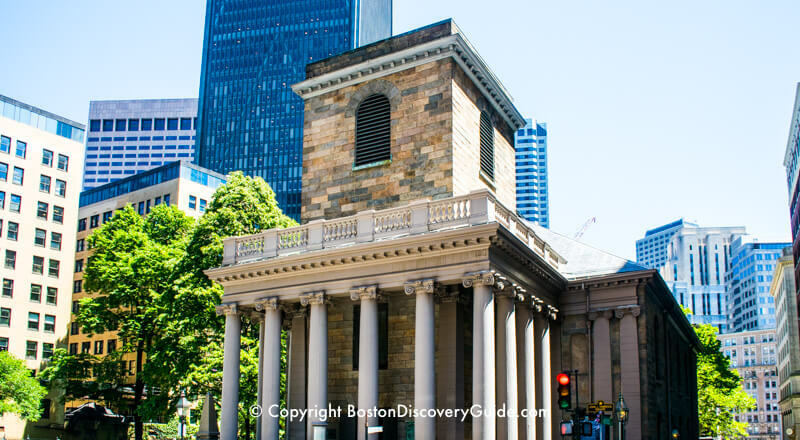 At the insistence of William and Mary, Boston gets an unwanted Anglican church when King’s Chapel is built at the corner of School and Tremont Streets, taking land from King's Chapel Burying Ground where the earliest Puritan settlers are buried. Publick Occurrences: Both Foreign and Domestic, America’s first newspaper, is published in Boston. William and Mary, joint rulers of England, notice the growing independence of the Massachusetts Bay Colony and appoint a Royal Governor to keep the colonists in line. Amid these troubled times as anxieties run high and people look for someone or something to blame, witch trials begin in Salem, 20 miles north of Boston. 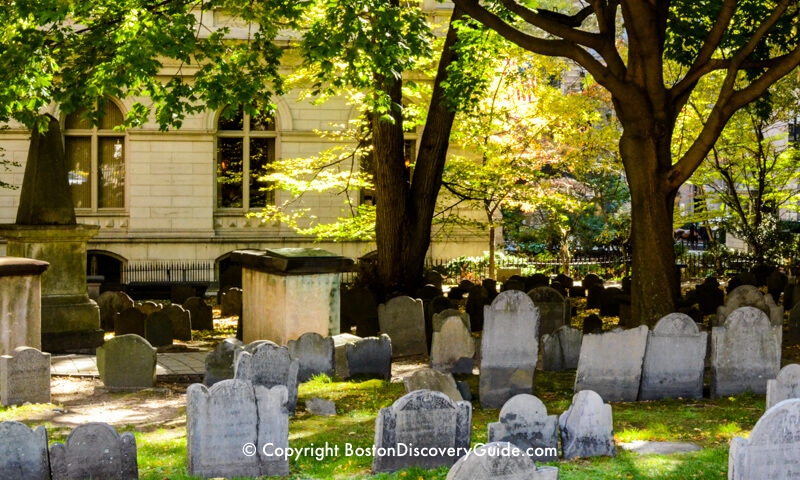 Local legend places Captain Kidd's ghost in King's Chapel Burying Ground . . . but that's only a ghost story. Any disquiet in this graveyard is probably due to the Puritan founders rolling over in their graves at the thought of the Anglican King's Chapel next door. The Boston News-Letter, the first regularly issued newspaper in America, starts publication in Boston. Benjamin Franklin is born in a 2-story, thatched-room house on Milk Street opposite the Old South Meeting House. On Christmas Day in 1706, a riot breaks out in the city with shouting, fist fights, and the breaking of church windows. The reason? Christmas. The Anglicans believe that it should be celebrated, and the Puritans do not. A terrible fire, termed The Great Fire (one of many Great Fires in Boston), destroys Boston’s Town House, the Old Meeting House, and about 100 other houses and buildings, kills a number of people, and leaves 110 families homeless. Boston establishes Boston Light, the first lighthouse station in North America, by levying a tax of one penny per ton on all ships coming into Boston Harbor. Situated near Little Brewster Island in the Outer Harbor, Boston Light will be destroyed by the British during the Revolution and rebuilt in 1783—making the “new” tower the second oldest in the U.S. It's featured in the children's book, Boston Light: Great Lighthouses of North America. Tensions in the Massachusetts Bay Colony increase. Colonists develop so much resentment toward the royal governor and his authority that they refuse to pay his salary. To protect the economic interests of its West Indian sugar colonies, England passes the Molasses Act, which levies “duties” - basically, taxes - on molasses, rum, and sugar imported from non-British colonies. Colonists feel these taxes are outrageously high. 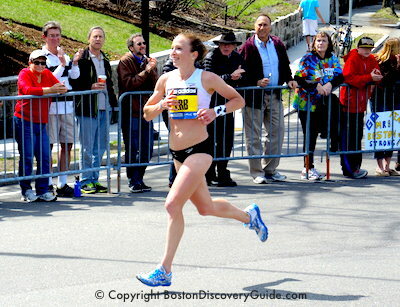 Meanwhile, Bostonian rum makers are getting rich by producing more than a billion gallons of rum per year by the 1730s. Rum is made from molasses, and molasses is a sugar by-product, and molasses was generally cheaper in the French West Indies than in the British West Indies—following all of this? Boston's rum makers react with great displeasure when they learn about the Molasses Act. 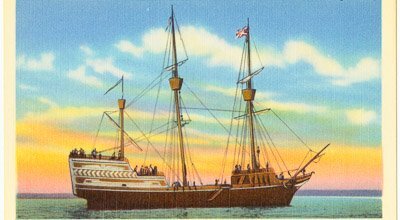 But no problem—duties are levied only when ships bearing the taxed goods enter harbors, so New England colonists turn them away. Meanwhile, they minimize the Molasses Act’s effects by perfecting their smuggling skills. Trinity Church, the third Episcopal church in the city, is built on Summer Street. Wealthy Boston merchant, shipbuilder, slave owner, and businessman Peter Faneuil builds and donates Faneuil Hall Marketplace to the City of Boston. Reverend Jonathan Mayhew uses the phrase, “No Taxation without Representation!” in a sermon in Boston. Soon, this phrase can be heard throughout the Massachusetts Bay Colony . . . and beyond. In March, another “Great Fire,” even worse than the one in 1711, sweeps through Boston, destroying 349 houses and stores, and leaving over 1,000 people homeless.